Infrastructure spending rates have an impact on the raw materials prices that go into these projects. Emerson’s Alan Novak, leader of the alternative energy and metals and mining industry teams, highlights the relationship between government infrastructure spending in China and iron ore prices. Iron ore prices have been on a wild ride. Since peaking in early 2011 at near $190/ton (driven largely by China steel demand due to infrastructure stimulus spending) iron prices have been under pressure, bottoming recently at under $100/ton. Why is China steel demand having such an impact on prices? As highlighted in a recent article in The Economist, The Lore of Ore, China passed Japan in 2003 to become the largest importer of iron ore and now accounts for 60% of total world imports. Even though steel demand in China is not expected to peak until 2026, short-term slowdowns will have tremendous influence on global iron ore prices. The impact on domestic Chinese ore producers is also dramatic as described in a recent article in China Daily, Iron ore prices drop to 3-year low. Their outlook, at least for the near term, is decidedly bearish. What does this mean for iron miners? In the near term the price drop has been hard on iron miners such as Cliffs Natural Resources (CLF) and Rio Tinto (RIO), and less so on equipment suppliers such as Joy Global (JOY) and diversified miners such as BHP (BHP) and Freeport McMoRan (FCX). Has the iron ore price found a bottom? Only time will tell. 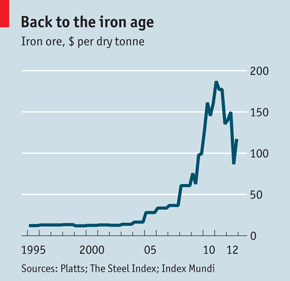 Will Australia Continue to Lead the World Iron Ore Market? Posted Tuesday, December 4th, 2012 under Metals, Mining, Minerals.